I have been interested in photography for the past ten years. I have traveled three times to Africa including visits to Kenya, Tanzania, Namibia, and Botswana. I have also photographed in Antarctica, in the Pantanal in Brazil, Costa Rica, and Japan. I have traveled and photographed extensively in the southwest portion of the US as well as the eastern part of California. This winter I traveled to Japan and the northern island of Hokkaido. It was quite an adventure. I photographed Steller Sea Eagles, Whooper Swans, Red Crested Cranes, Snow Monkeys (on the main island), and White-Tailed Eagles. 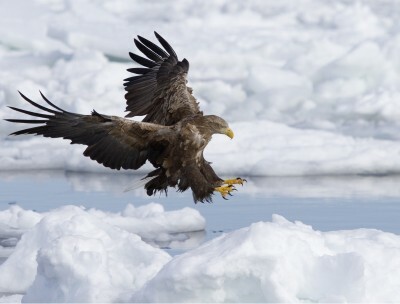 This photo of a White-Tailed Eagle was taken as it landed on sea ice outside of the port of Rausu.